A growing body of research supports methods for evaluating arsenic bioavailability. In 2012, USEPA (2012a) released a compilation of the studies conducted to date on the RBA of arsenic from soil. This document summarizes the studies, animal model used, number and characteristics of the soils tested in each study, arsenic concentration, and reported RBA for each soil. Subsequently, additional studies have examined specific sites or assessed the relationship between soil characteristics and bioavailability (DTSC 2015; Basta et al. 2016). More recently, a paper described a regression model that predicts in vivo oral relative bioavailability (RBA) of arsenic in soil from measurements of in vitro bioaccessibility (IVBA), this is also known as an in vivo – in vitro correlation (IVIVC) (Diamond et al. 2016). These studies inform the assumptions used to characterize arsenic bioavailability by several methods and are discussed later in this section. Based upon the analysis and external independent peer review, the following conclusions have been determined: 1) currently available research information suggests that an RBA of arsenic in soils can be expected to be less than 100 %; 2) based upon evaluation of current data sets of arsenic RBAs in the US, the upper percentile of the data set results in a RBA value of 60 %; 3) the default RBA for arsenic in soils should only be used if site-specific assessments for arsenic RBA are not feasible. Multiple in vivo methods have been developed to evaluate the RBA of arsenic in soils (see Methodology). Early studies were conducted on rodents and rabbits, but most recent studies have focused on mice, swine, and monkeys (Basta and Juhasz 2014) (Roberts et al. 2002; Roberts et al. 2007; Bradham et al. 2011). The juvenile swine and adult mouse in vivo models have been used as the basis for RBA estimates for the most soils studied to date (see Table 7-1). The juvenile swine model has gained widespread acceptance internationally by regulatory agencies because the gastrointestinal environment of juvenile swine is similar to that of children (Weis and LaVelle 1991; Casteel et al. 1996). USEPA has accepted the juvenile swine model as a standard operating procedure (SOP) for assessing the RBA of lead in children and subsequently applied for assessing RBA of arsenic. The USEPA SOP includes information on sample collection and analysis for arsenic, but Brattin and Casteel (2013) have best documented the details of using the swine model for arsenic see also (Casteel et al. 2006). While the adult mouse model is gaining regulatory acceptance in some agencies, the Florida DEP chose to use primates in a study of arsenic bioavailability from soil because their physiology is similar to that of humans (Roberts et al. 2002). Every animal model has advantages and disadvantages; therefore, the model should be carefully selected and any in vivo studies should be discussed with the appropriate regulatory agency early in the selection process. In vitro bioaccessibility (IVBA) methods may include gastric extraction alone or sequential gastric to intestinal extraction, with each phase considering several key GI tract physiological factors including pH, chemical composition of gastrointestinal solutions, soil extraction time, and soil/gastro(intestinal) solution ratio (Basta and Juhasz 2014). Most IVBA methods employ a gastric pH of 1.2-2.5. The chemical composition of IVBA solutions range from simple gastric phase systems that contain limited constituents to highly complex solutions that contain multiple organic and inorganic components. Extraction times vary slightly with different methodologies. Aside from the chemical composition of gastrointestinal solutions, many of the IVBA methods are similar (for example, temperature, soil:fluid ratio, agitation) (Basta and Juhasz 2014). Table 7-3 (see section 7.3.4.1) includes published in vitro methods for arsenic. The most important criterion for selecting an in vitro method is a successful in vivo – in vitro correlation (IVIVC) that has been established as predictive of RBA across a diverse set of soils reflecting various sources and soil characteristics. In the case that a ‘validated’ in vitro method is used to estimate bioavailability, it is recommended that the protocol specified in the methodology be followed for making the extrapolation from in vitro data to in vivo values. That is, there is no a priori assumption that all validated in vitro methods must yield results that are identical to in vivo values. Rather, it is assumed that a mathematical equation will exist such that the in vitro result (entered as input) will yield an estimate of the in vivo value (as output). A search of the literature was conducted to identify studies in which soil arsenic RBA was estimated from data collected in controlled human clinical studies or from animal bioassays. Studies that reported only bioaccessibility measurements (e.g., in vitro extraction of soils) or that attempted to predict arsenic RBA from bioaccessibility measurements were not included in this data compilation for several reasons. Although there is good evidence to suggest that bioaccessibility influences and may be an important determinant of RBA, there is no current consensus on whether or not in vitro bioaccessibility measurements can be used to accurately predict soil arsenic RBA. EPA has not identified a validated in vitro assay for predicting RBA. Other on-going efforts by EPA are evaluating methods for predicting arsenic RBA from bioaccessibility measurements. Since this USEPA literature review, four IVIVC comprehensive studies have been conducted. USEPA has funded two of these studies to evaluate USEPA’s IVBA method, USEPA Method 1340 (Brattin et al. 2013; Diamond et al. 2016). Additional discussion of IVIVC is included in the Methodology section. USEPA (2007c) recommends following the Interagency Coordinating Committee for Validation of Alternative Methods (ICCVAM) validation criteria for a method to be used in regulatory risk assessments (ICCVAM 1997). Only a few RBA methods have reported IVIVC as defined by USEPA (2007c). These methods include the Solubility Bioaccessibility Research Consortium (SBRC) method, the Unified Bioaccessibility Method (UBM), the Relative Bioavailability Leaching Procedure (RBALP), and the OSU IVG method (Rodriguez et al. 1999), replotted with data from Basta et al. (2007). Arsenic RBA can be determined using the mathematical simple linear regression meeting the requirement of USEPA (2007c) where “the in vitro result (entered as input) will yield an estimate of the in vivo value (as output).” Table 7-2 summarizes the IVIVC for the above IVBA methods, which are published in peer reviewed scientific literature. The OSU IVG method was the first to report that an inexpensive IVBA method can be used to predict arsenic RBA and arsenic exposure for children from ingestion of arsenic-contaminated soil (Rodriguez et al. 1999). This method incorporated the animal feed dosing vehicle used in the juvenile swine RBA. A variety of studies investigating IVIVC to predict arsenic RBA have been published over the past 15 years (Table 7-2). Several of the in vitro methods with strong IVIVC are actively being used to make site-specific decisions (Table 7-3). USEPA Method 1340, California DTSC CAB Method, and the International Organization for Standards (ISO) 17924 all have published guidance. The OSU IVG method was the first to report a strong IVIVC for arsenic, and many practitioners use this method to make site-specific decisions. Regulatory guidance has not been issued for this method because there was not an interlaboratory round robin study, which is an important requirement for regulatory guidance. The Physiological Based Extraction Test (PBET) developed by Ruby et al. (1996) is also commonly used to make site-specific decisions, particularly in urban areas. Although it is widely used, PBET does not have any associated guidance or a valid IVIVC. Note: Diamond et al. (2016) combines data from three studies. The soil types that Diamond et al. (2016) used are described in other studies as well (Bradham et al. 2011; 2015; Brattin et al. 2013; Brattin and Casteel 2013); and (Juhasz, Smith, et al. 2009; 2014). Diamond et al. 2016 Method adopted by USEPA. Guidance issued May 2017 (USEPA 2017e). In Vitro Gastrointestinal Method (IVG) Basta et al. 2007; Rodriguez et al. 1999 No regulatory guidance exists to support this method. First published method to report strong IVIVC, but did not include interlaboratory round robin study necessary for regulatory guidance and approval by USEPA. Physiological Based Extraction Test (PBET) Ruby et al. 1996 No regulatory guidance exists to support this method. Several studies have detailed efforts to develop an IVIVC for arsenic. Table 7-2 lists these studies, the animal model used for developing the RBA estimates, the soil types studied, and the regression equation that resulted from each. All of these studies describe the in vitro methods used to predict RBA for arsenic. As with all research, each of these studies has strengths and limitations, but together they provide a strong technical basis to establish that in vitro methods are generally predictive of RBA results as measured in vivo. Specifically, the studies show that for arsenic, in vitro extraction in simulated gastric fluid provides a better approximation of RBA than results from gastrointestinal phase extractions. Few studies have investigated how different in vitro methods for arsenic vary when applied to a single set of soils. The Strategic Environmental Research and Development Program (SERDP) funded one study, ER-1742 (Basta et al. 2016), which investigated an IVIVC study of five IVBA methods for use in predicting arsenic RBA for 27 soils studied in juvenile swine and adult mouse animal models. The IVBA methods studied in ER-1742 were USEPA 9200 (now USEPA 1340), which is the same as SBRC; Royal Military College Physiological Based Extraction Test (RMC PBET); Unified Bioaccessibility Method (UBM); Ohio State University In Vitro Gastrointestinal methods (OSU IVG); and California Arsenic Bioaccessibility Method (CAB). 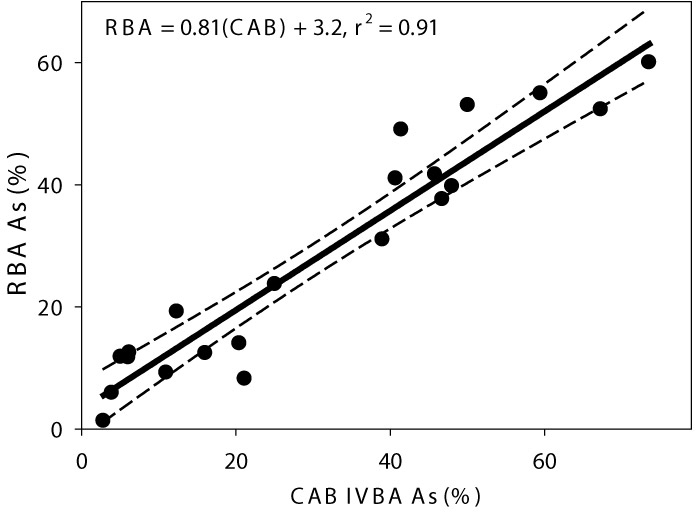 All IVBA methods were predictive of RBA determined from both the mouse and swine bioassays. Several agencies offer guidance for arsenic RBA in addition to the key bioavailability guidance documents and general practices summarized in Regulatory Background. During the decision process to determine whether a site-specific assessment of bioavailability should be conducted, an evaluation of the regulatory constraints should be performed. California has recently developed guidance for arsenic-contaminated soils that relies on an in vitro method, the California Arsenic Bioaccessibility (CAB) method. The CAB method was developed through a 2008 USEPA Brownfields program grant that generated an extensive database on bioavailability and bioaccessibility data for soils from California. Details of the effort have been published in the peer-reviewed literature (Whitacre et al. 2017). Under this effort, the California’s DTSC conducted a comprehensive IVIVC study of three IVBA methods using 18 soils contaminated from historical mining activities. Results from the three IVBA methods (USEPA Method 9200 [now USEPA 1340], the CAB method, and OSU-IVG) were compared to in vivo RBA measured in juvenile swine for matched soil samples. The CAB method was selected as the IVBA method that best met California DTSC’s recommendation for predicting the RBA. At sites under its jurisdiction, DTSC recommends using IVBAs equal to or greater than the 90% confidence limit of the RBA as measured in swine, thus minimizing the potential to underestimate the RBA. The specific methods are described in Whitacre et al. (2017) and resulted in an IVIVC for the CAB Method as depicted in Figure 7-2. Subsequent testing on a wide range of soils contaminated with arsenic also showed good agreement between the results of the CAB method and RBA for this broader set of soils with arsenic concentrations below 1,500 mg/kg. The CAB method is recommended by DTSC as the appropriate method for estimating the RBA of arsenic in soils in California with total arsenic concentrations below 1,500 mg/kg. In August 2016, the CAB method was introduced in a guidance document, Human Health Risk Assessment Note 6: Recommended Methodology for Evaluating Site-Specific Arsenic Bioavailability in California Soils (DTSC 2016b). Arsenic occurs naturally in the soils of Hawaii, and is found in native soils. However, elevated levels of arsenic in soils have also been identified associated with historical use of pesticides (application, storage, mixing) in sugar cane fields, wood treatment, and other uses (Hawaii DOH 2010). In response, the Hawaii Department of Health (DOH) provides Soil Action Levels for arsenic as part of their recommended soil management practices (Hawaii DOH 2012). This guidance describes a hierarchical approach that considers background in determining appropriate management and evaluation of arsenic-contaminated soil, and recommends using bioaccessibility testing to estimate the RBA of arsenic for soils above background. Specifically, the Hawaii DOH guidance states that for soils with arsenic concentrations above the 24 mg/kg background criterion, bioavailability can be estimated by extraction using a simulated gastric fluid buffered to pH 1.5. The results from the extraction test (expressed in concentration form) can be used directly in risk-based evaluation as representative of arsenic RBA. The guidance states that this recommendation for use of arsenic bioaccessibility data is based on a review of the published literature conducted to date, and is “supported by studies of arsenic-contaminated soils from the Kea’au area of the Big Island of Hawaii,” wherein soils were evaluated both in animal studies and in vitro, using this bioaccessibility method. The Hawaiian guidance bases action levels on bioaccessible arsenic expressed in concentration form, and not percentage form, for soil cleanups at sites with varied soil properties and a broad range of total arsenic concentrations. The Diamond et al. 2016 paper concludes that the in vitro method investigated “has several important attributes that make it highly suitable for [use in] risk assessment.” USEPA Method 1340 (USEPA 2017c) has been validated for the assessment of arsenic bioaccessibility (USEPA 2017g, e) and is the only method the USEPA Bioavailability Committee of the Technical Review Workgroup (TRW) currently accepts for use at USEPA-lead Superfund Sites. The TRW may evaluate the use of other validated methods when they become available. The Unified Bioaccessibility Method (UBM), developed by the Bioaccessibility Research Group of Europe (BARGE) has been used to predict the RBA of arsenic in soil (Wragg et al. 2011; Denys et al. 2012). BARGE, which is a consortium of bioavailability researchers and individuals from regulatory agencies within the EU, collaborated to validate this in vitro method against animal data from a juvenile swine model and considers it predictive of RBA from soil for arsenic, lead, cadmium, and antimony (BARGE) . The UBM method has achieved ISO designation (17924) and has been applied within the EU and in other countries.